Dawn is breaking as you set off, your gaze fixed on the distant peaks. The Mens Exolight Mountain Jacket is a super lightweight, weatherproof shell jacket developed in close collaboration with the Alpine School Innsbruck (ASI) specifically for mountain use. The jacket is made of Texapore Air+. This very light, high performance weather protection fabric guarantees a superb wear climate all day long. The fabric is dynamically breathable and air permeable. The more intense the activity the better the air exchange through the fabric, with warm, moist air being quickly expelled to the outside. It is also slightly stretchy and has a soft feel for superior next-to-skin comfort. 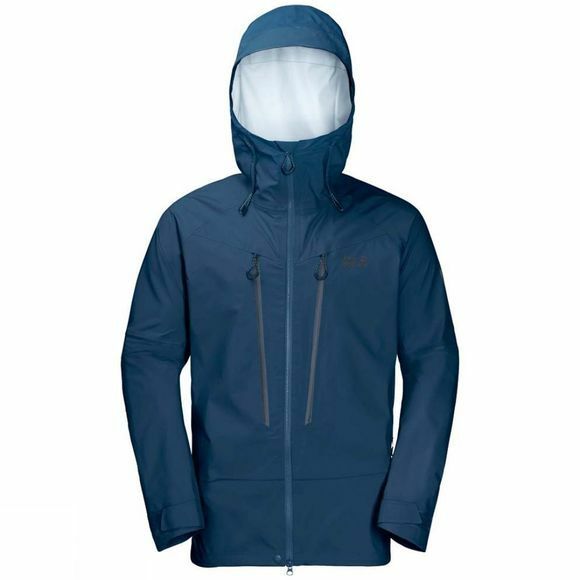 Add in the pro-standard detailing (pit zips, extended chinguard, helmet-compatible hood) and it's no surprise that the Mens Exolight Mountain Jacket is recommended by the ASI guides for all mountain activities. And if the temperature drops when you're above the tree line, there is enough room under the jacket for an insulation layer.